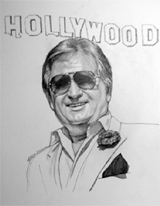 Danny "Hollywood" Clisham is America's most celebrated Air Show Announcer. Danny is the proud recipient of the following awards. 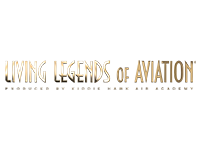 The Living Legends of Aviation is an award honoring achievements in the aerospace industry, bestowed by the current title holders and owned and produced by the Kiddie Hawk Air Academy, a non-profit 501(c)(3). The Living Legends have all made significant contributions to many areas of aviation including: innovators, record breakers, astronauts, aviation entrepreneurs, industry leaders and celebrity pilots. Honorary Golden Knight is the highest honor the Team awards to people who are not Team members. 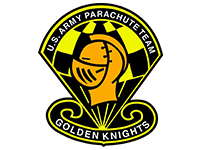 Honorary Golden Knights have developed a special relationship with the Team through their extraordinary contributions of time, effort & support; through their friendship & shared experiences; and/or through their unique appreciation of the Team and its activities. This honor is the Team' s way of saying "Thank You" for their valuable service and/or special relationship with the Golden Knights. Military or civilian personnel are eligible. Selection of the Honorary Golden Knights is made yearly by secret ballot. 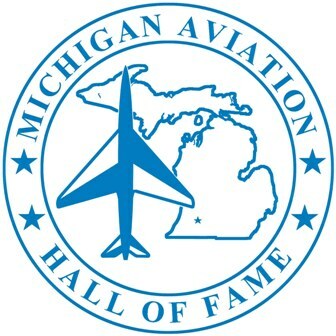 The Michigan Aviation Hall of Fame (MAHF) honors men and women for their outstanding contributions and achievements to aviation and/or space. They had a vision and followed their dreams with determination and triumph. 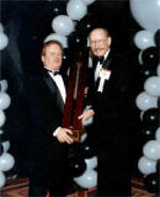 The International Council of Air Shows Foundation inducted Danny Clisham into the Air Show Hall of Fame on December 13, 2007, in recognition of his distinguished career as North America's preeminent air show announcer. Danny joins 33 other air show legends who have made a significant contribution to the air show industry. Danny Clisham was the 2006 recipient of the Bill Barber Award for Showmanship, awarded annually by World Airshow News magazine and the friends and family of Bill Barber. The award recognizes an air show entertainer who has exhibited superb showmanship ability. The award honors Bill Barber, who was known for his attention to entertainment value in his air show performances. Barber was also a personal friend of Danny's. At right, Danny poses with Bill Barber (center) and Jimmy Mynning (right). In 1996, Danny joined the ranks of aviation legends such as Robert A. "Bob" Hoover, Sean D. Tucker, Jimmy Franklin and Patty Wagstaff who have been honored by fans as a favorite. 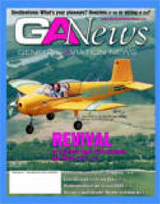 Danny was the readers' choice for favorite air show announcer. In 1995, Danny was invited to join the Honorary Snowbirds Society by a panel of former Snowbirds Team Leaders. Membership in this elite society numbers less than 100 people world-wide. The Snowbirds are the Canadian Forces Jet Demonstration Team and a Canadian icon. For 35 years they have symbolized excellence in Canada's armed forces. As ambassadors for Canada around the world, their skill and precision flying exemplifies the best in Canadian aviation. Each year, the International Council of Air Shows presents the Art Scholl Showmanship Award to the air show act or performer which best exemplifies the qualities of showmanship demonstrated by Art Scholl. Art's exacting and entertaining performances were a reflection of the best in the air show industry. He was a dedicated professional who practiced tirelessly to get the most from himself, and his showmanship always left his audiences wanting more. Throughout his career, Art set the standard by which all other air show performers have since been measured. 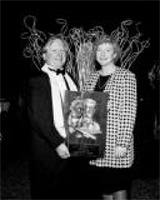 Danny's award (left) was presented by Art's widow, his good friend Judy Scholl. Clifford W. Henderson, founder of the Cleveland National Air Races in 1929, was a pioneer among the early and spirited proponents of flight. He had the foresight to see that aviation would play a vital part in our country's business and economic growth. Together man, machine and developing technology would shape the growth of modern transportation well into future decades. Henderson also knew that the success of aviation was dependent upon the commitment of others with these same beliefs. The annual Clifford W. Henderson Achievement Award is a tribute to those outstanding individuals, who by their involvement and dedication, have demonstrated a profound "belief in aviation." Since 1981, the International Council of Air Shows Sword of Excellence has been synonymous with air show excellence. Given each year to recognize outstanding service and personal contributions to the air show industry, the Sword is widely considered to be the single highest honor an individual air show professional can receive. In 1992, Danny was honored for his leadership, service, innovation, vision, commitment and selfless contributions to the air show business. At right, Danny celebrates his award with the illustrious Robert A. "Bob" Hoover, himself a Sword of Excellence winner. The Bob Johnson Award for Outstanding Flight Achievement is Evergreen International Airline's equivalent of Pilot of the Year. Bob Johnson was an integral part of the Tall Timber legacy in the Pacific Northwest and the first to initiate smoke jumping to fight forest fires. It was Bob Johnson's aviation organization which later became Evergreen International Airlines. At left, Danny poses with his award and none other than Bob Johnson himself.